The Nation magazine occupies a unique and powerful position in the political, cultural, and historical landscape of the United States and has since its launch by abolitionists at the end of the Civil War. Our storied history of publishing includes visionary thinkers and writers like Albert Einstein, Eleanor Roosevelt, James Baldwin, Hunter S. Thompson, and Martin Luther King Jr.
Today’s contributors include Katrina vanden Heuvel, Naomi Klein, Michael Pollan, Laila Lalami, Michelle Alexander, Tony Kushner, Christopher Hayes, Eric Foner, Bill McKibben, Dave Zirin, Alice Waters, Marilynne Robinson, Katha Pollitt, and Calvin Trillin. 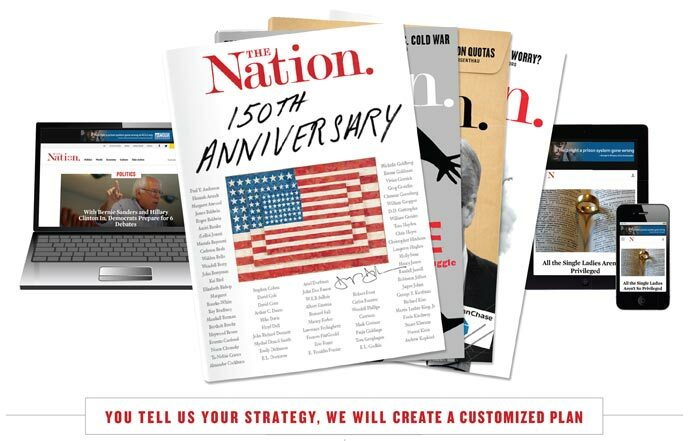 The Nation magazine has been instigating progress for 150 years. Our award-winning reporting has led to congressional investigations and legislation, inspired grassroots movements, and ignited debate that shows a path forward. To advertise with The Nation, please click here to download our Media Kit. 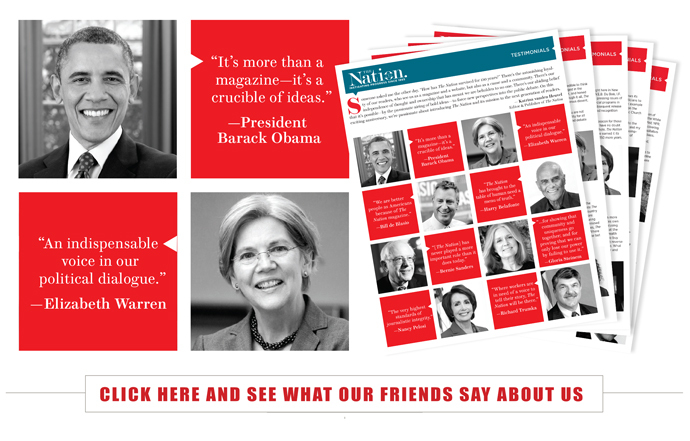 To see what President Obama, Elizabeth Warren, Bernie Sanders, Bill Maher, Alec Baldwin and others have to say about The Nation, please click here.